One of the best places to see the fall colours is the Finger Lakes area of upstate New York. Please join us on our 3 day fall colours tour from Toronto to the Finger Lakes area. We leave on Friday morning from the Toronto area, stopping for lunch along the way. Before we arrive at our hotel, we enjoy a scenic 2 hour cruise on the Erie Canal and then go to our hotel, the very new Hilton Garden Inn in Auburn, NY. We spend Saturday in the Ithaca area, also known as the land of waterfalls. On Saturday afternoon, we do some wine tasting and then go shopping in the evening to the very impressive Destiny USA shopping mall in Syracuse, NY. We check out of our hotel on Sunday morning and do some touring around Cayuga Lake, Our lunch is at Belhurst Castle perched on the edge of Seneca Lake before we head back to Toronto. Prices below are in Canadian dollars, all taxes and tips are included. Full 100% refund if you cancel at least 14 days before the trip departure date. 3-day trip to the New York State Finger Lakes area. Two nights accommodation at the brand new Hilton Garden Inn, Auburn, NY. Two hour narrated Erie Canal boat cruise included. Lunch at Belhurst Castle included. Wine tasting at Kings Ferry Winery included. Guided tour of the unique McKenzie Childs farmhouse and showroom included. Guided tour of the Ithaca area state parks & waterfalls included. Visit to Ithaca Commons included. Visit to Destiny USA Mall included. Optional group dinner at the Point At Sand Beach Historical Chapel. Dinner is optional and cost of dinner is not included in the tour price. Complimentary bottled water, juices and snacks during bus journey included. We leave Toronto on Friday morning at approximately 8:00 AM. Actual pickup times vary by stop and will be sent out in the final email to all registered attendees, 3 days before the trip. We return to Toronto at approximately 8:00 PM on Sunday night. 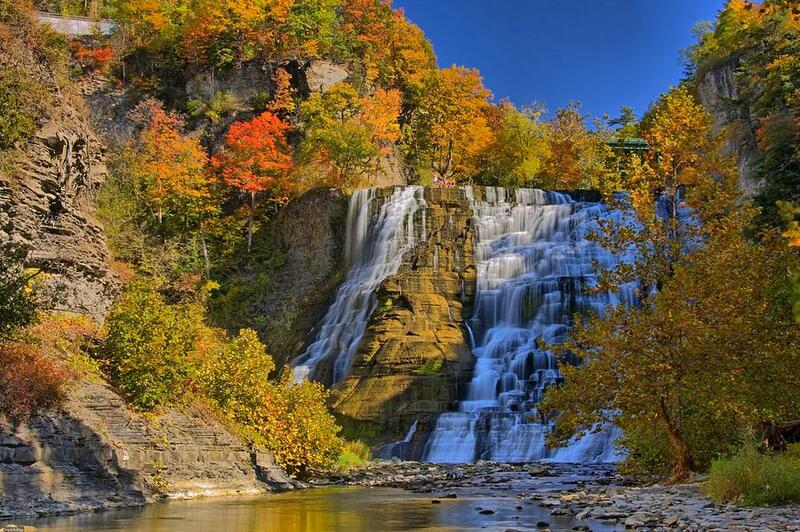 From small cascades to thundering waterfalls that drop hundreds of feet, Ithaca is renowned for its spectacular landscape featuring rolling hills, scenic gorges and of course, the more than 100 majestic waterfalls around the region. The towering waterfalls are one of Ithaca’s largest draws and a must-see attraction any time of year but especially in fall colours season. Our guided tour will take us past breathtaking vistas, towering gorges and the sounds of the roaring water as it plunges into the pools many feet below. One of the most picturesque small towns, the downtown area of Ithaca, known as Ithaca Commons, is a pedestrian only area surrounded by quaint stores, cafes, diners and restaurants. One could easily spend an entire day browsing this area. We will be stopping here for lunch on Saturday afternoon. 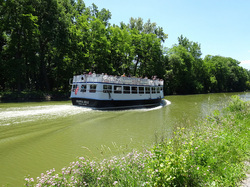 The Colonial Belle's narrated tour will familiarize you with the rich history and many traditional landmarks along the scenic Erie Canal traveling west between Fairport and Pittsford. The cruise also includes passage through the locks at Canal Park in Pittsford. Words simply are not enough to describe the farmhouse. It's one of those unique places where one can truly say, "You just have to be there!". The farmhouse is located on a 65-acre former dairy farm overlooking Cayuga Lake in the heart of the Finger Lakes region. The grounds house the production studio, a Second-Empire farmhouse and a retail shop filled with MacKenzie-Childs tableware, home furnishings, and gifts from around the world. The picturesque farm is also home to a small herd of Scottish Highland cattle, dozens of birds roosting in the Gothic Revival-style Chicken Palace, a duck pond, a former Cornell horse barn, a 1930's greenhouse, spectacular and ever-changing gardens, and plenty of hay fields. On our way home on Sunday, we will stop for lunch at the very impressive Belhurst Castle. Perched right on the edge of Seneca Lake, just south of the town of Geneva, NY, Belhurst is listed on the National Register of Historic Properties and has been voted One of the Most Romantic Places in New York State. It has consistently won Awards of Excellence in the Wine Spectator Restaurant Awards Program, and continues to be one of the most beloved destinations in the Finger Lakes. A visit to the finger lakes would not be complete without a visit to a winery for some wine tasting. This is after all, the wine producing region of New York State. King Ferry Winery, maker of Treleaven Wines, is superbly located on the east side of Cayuga Lake. The winery produces multiple award winning wines including Chardonnays that are crafted in a centuries-old Burgundian tradition.